I have been informed that my previous link to my presentation slides was not working. I’m sorry about the error. WordPress is the most popular open-source Content Management System( CMS ) in use today. According to a study by W3Techs, it is used on almost 32% of websites. 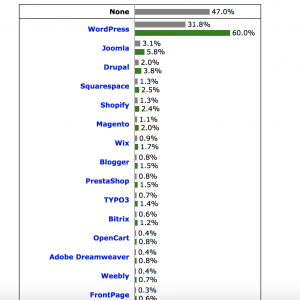 And it makes up 60% of websites that use a CMS. Let’s dive into why choosing WordPress for your website is a good idea. The actual software is free. That does not mean that having a WordPress site is free. There are a few options available to get your software. There is WordPress.org and WordPress.com. You still need to have a web hosting service to run your website on. WordPress.org is a place where you can get hosting. I do not recommend it for running a business. It is more of a platform like Blogger for hobby or blogging only sites. They do have high priced services available but it is still limited compared to what you can do on on a self-hosted site. 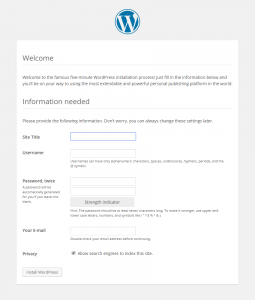 WordPress.org is a more of a community where you can download the software to put on your own web hosting. For the cheaper options, there is shared hosting like GoDaddy or Host Gator. Though what really gives you a better experience is Managed WordPress hosting. These are web hosting companies that specialize in just hosting WordPress sites. Some to consider are WPEngine, Flywheel and SiteGround. It is famous for its 5 Minute Installation, which walks you through the speedy installation. It is quick and easy. So much so that you don’t have to be a techie or geek to do it. Though most hosting companies make it even easy with a 1 click install. And most of the Managed WordPress hosting merely have a create new website type of install. It has been around since 2003, giving it lots of time to create lots of support documentation. WordPress.org is the perfect place to start when looking for answers to any question or problem you might have. The forums are vast and pretty much everyone is super helpful. There are many Meetup groups all over the world. And even bigger are the WordCamps– volunteer led conferences about WordPress that have something for every level of expertise. There are thousands of themes available to make your site look how you want. The themes even come ready for different functions. Let’s say that you want an online magazine. Or an e-commerce site. The sky’s the limit with themes. Some are free and others aren’t. Yet even the paid themes aren’t too expensive. The themes let you customize pictures, colors and many other elements. If you need even more functionality that isn’t in a theme, then you can add plugins. Plugins are extensions of the basic WordPress software that let you do more specialized actions with your website. You can have contact form plugins, digital marketing plugins, e-commerce plugins, or payment plugins. It all depends on your business needs. Empowering business owners to take control of their website by making it easy to manage. It is always a nice thing to not really need a developer to do the simple things of writing your own blog, adding new content or even removing old content is really a big deal. Many business owner still use developers for more complicated or time consuming issues, but the freedom to choose is a great thing. It was made with SEO in mind. To make your SEO efforts even more effective, use the Yoast SEO Plugin. It makes security a priority. It is essential to keep you software, themes and plugins updated to stay secure. Even updating is a cinch. You merely check the boxes of the software needing an update and click update. You even get notified when something needs an update. When you want a professional looking website that gets results and is easy to setup and maintain, WordPress is still your best bet. If you still feel unsure about which CMS to use, or just want the extra help getting your WordPress site running. I’m ready to help you so you can concentrate on running your business. Gutenberg has been a major talking point for WordPress users for a good part of a year now. It is will change how we create posts and pages in WordPress for the better. It makes it easier to create rich content with a new visual editor. Let’s take a closer look at it and see how it will affect your WordPress experience. Gutenberg is the name given to the new WordPress editor, which is named after Johannes Gutenberg. He invented the movable type printing press in the mid 1400s. The current editor on WordPress looks like a normal text editor and requires a bit of finessing with shortcakes and HTML to change the layout of the page or post. Gutenberg solves this issue by letting the user create “blocks” that can be easily formatted and arranged on the page by drag and drop. You can go to Gutenberg’s official WordPress page for a demo and try it out. If you want to dive deeper into Gutenberg, it is available to install to WordPress 4.8 and later as a plugin. Also when you update to WordPress 4.9, it is given as an option on the WordPress dashboard in the WP admin area. Keep in mind that Gutenberg is still in the beta testing phase, so functionality may not be limited. But you will get a good idea of what is to come. Make sure that you are trying it out on a testing site or setup a staging environment with your hosting. Once you have installed and activated Gutenberg, you will see it appear in the WordPress sidebar like any other plugin. It also takes you to a sample post that is a brief tutorial of some of its features. Since Gutenberg is still being tested, it gives you the option to switch between the classic editor and the new editor. You will find this in the top left. Click on the plus sign and a drop down menu appears. Under the Formatting menu you will find the option to switch back to classic editor if need be. Also this is where you will find the options for adding custom code into the pages. In this same drop down from the plus icon, you can also see some new cool options. The Layout Elements menu allows you to insert buttons, columns and some other neat features. And the Embed menu item gives you the option to embed video/music easily from various sources. On the top right of the post you will find a Gear symbol. When clicked it brings up the settings both for the document in general and for selected blocks. The document settings gives you the regular setting of status/visibility, categories, tags, featured image, excerpt, and discussion options. When you have a block selected, it shows the settings for that particular block. Clicking on the i icon in the left hand side of the menu will give you a quick overview of your post. It gives you word count, headings count, paragraphs count and a block count. It also gives you a nice document outline to see what your document looks like. The triple dots, or more icon, on the top right of the menu lets you switch between the visual editor and the code editor. And a few other extras. I honestly haven’t gotten to play with Gutenberg as much as I would like yet. But from what I see so far there will be many cool features that make it easier to create beautifully laid out post and pages. It is worth the time to try the plugin now before it rolls out permanently on WordPress 5.0. At that time it will no longer be optional to install. Though there will be a plugin to disable Gutenberg at that time. It is still best to try it out now and see if you will want it disabled or not. Have fun trying Gutenberg on your WordPress site! If you need help designing, developing or maintaining a WordPress site, I’m ready to help you so you can concentrate on running your business.